Sunset is a peaceful time to boat on the Columbia River in Portland, Oregon. This Friday it’s all about cross-training. No, not that kind. We’re not going to bust out the sneakers and lift weights, run, swim and bike all before breakfast! I’m applying this concept to photography. The point I’m making here is this: whatever types of subject you are primarily interested in, there is much to be gained from going into a different environment to capture images from time to time. Here I will use the example of landscape/nature vs. urban/street photography. A view from the red Broadway Bridge in Portland, Oregon. This required some real creative positioning to get the composition just right. Since I am primarily a landscape/nature photographer, it is a stretch for me to go into the city with my camera. But as with many things, once I am there I lose myself in the moment. For me, one of the bigger challenges in the urban environment is finding compositions without too much clutter. I often need longer focal lengths on cityscapes than in landscapes for precisely this reason. For example, there always seems to be annoying wires to deal with. I’ve never found a picture in which wires add anything. They only take away. I wish that when Edison lighted New York City after inventing the light bulb, he would have pushed for burying utilities. If they would have done that early on, it would have been much cheaper. Now, with all the development, it’s nearly impossible to do so at a reasonable cost. The cherry blossoms along Portland, Oregon’s waterfront are a nice place for a stroll on an evening in springtime. Reducing the number of elements in your compositions is one of the many things the two kinds of photography have in common. And moving into the environment with which you are less comfortable will force you to become better in this regard. Finding more ways to simplify your compositions is but one example of how this kind of cross-training can benefit your photography. I really feel that landscapes and cityscapes share much in common. But at the same time they are dissimilar enough so as to make crossing over a useful yet fairly painless exercise. A large warehouse, now in disuse, shows off its huge textured wall at Portland, Oregon’s old rail station. In both types of photography, you will be getting a variety of shots, from wide overviews to the smallest details. And yet it will be a challenge to find leading lines, strong subjects, and dramatic backgrounds in the environment you are least familiar with. A bonus for me is that living things are much easier to find in the city than in nature. The kind of diversity you find among living things in cities is different than in nature. And the approach you use to put the creatures at ease is quite different as well. Animals are easier in some ways, in that they never ever ask for money and are never unhappy with their looks. But in both cases, with people or with animals, once you have earned their trust, you’re in! The Willamette River flows past Portland’s waterfront with Mount Hood standing in the background. Once the sun has set and you enter the realm of night photography, the city offers some unique challenges, not the least of which is the mixed lighting present. But at blue hour, when the sky attains that deep purplish-blue color, and the lights have come on, cityscapes can truly be magical. In the natural world, you are hard-pressed to include much of the foreground during blue hour, unless you have recognizable silhouettes or are next to water. In the city, you can include as much foreground as you want since it is almost always well lighted. Once the sky goes black, you need to minimize the sky in the city. In nature, this is the time to go for the stars! Deep shadows during the pretty but dimmer light of dusk present a challenge for urban photography. This is just one example of photographic cross-training. You can probably think of others. Go ahead and include them in your comments below. It is a great way to avoid the dreaded photography rut, of course; that’s the obvious benefit. But it will also allow you to overcome challenges in a manner different from what you are used to. Thus it will give you more tools to work with, both in and out of your favorite photographic environment. I really think cross-training can greatly benefit the images you capture of your favorite subjects. And as a bonus it will help to diversify your portfolio. Downtown Portland, as viewed from the Fremont Bridge. Not many drivers risk a stop here, so you can be sure this viewpoint is not over-photographed. Remember to click on any images you’re interested in to go to a larger version. Then click “add to cart” to see price options. It won’t be added to your cart with this first click; you need to confirm after seeing the prices. Thanks for not downloading these too-small versions. They are copyrighted and require my permission to use. Please contact me if you have any questions or special requests, for instance if you wish to inquire about framed and signed pieces. The skyscraper in Portland informally dubbed “Big Pink” reflects a technicolor sunset. Reflective buildings often take the place of water in landscape photography. The theme of the post is bridges, as inspired by Ailsa’s blog. Check that out for many more bridge posts and pictures. 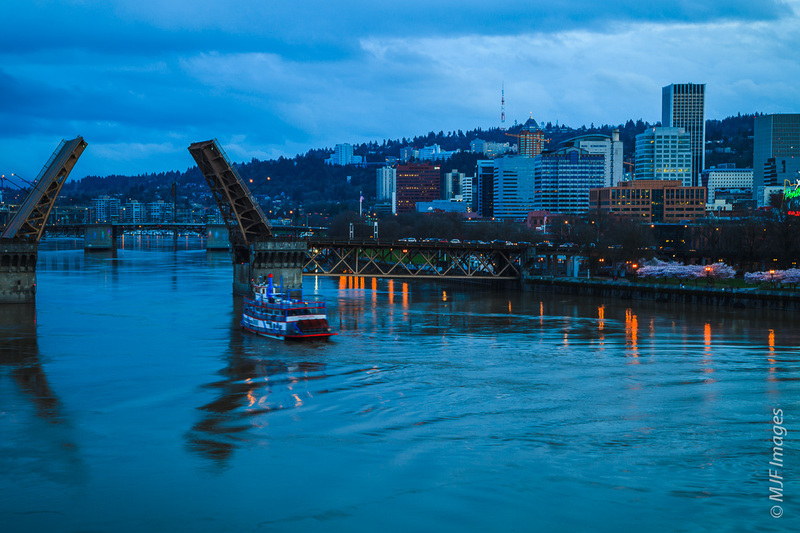 I live in a city with the nickname (among others) of Bridgetown: Portland, Oregon. 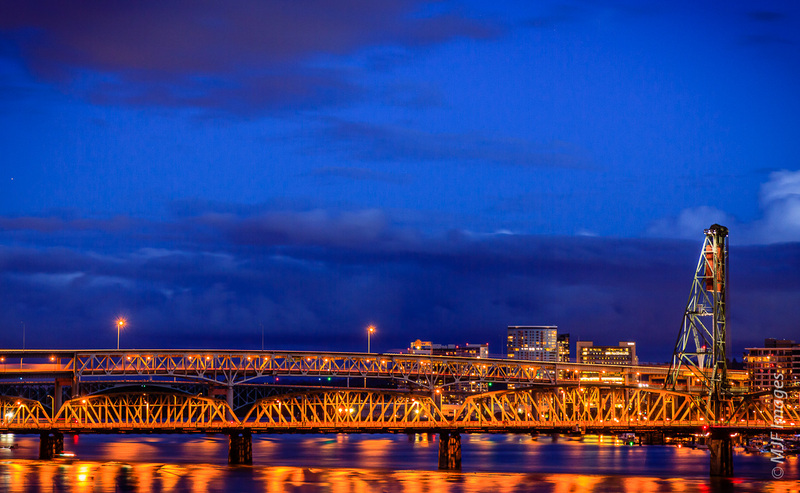 Most bridges span the Willamette River as it runs through the center of town. But a couple cross the much larger Columbia just north of town heading into Vancouver, Washington. The view south from central eastside Portland takes in the Hawthorne and Marquam Bridges. The Morrison Bridge in Portland, Oregon opens for a pleasure boat. When I go hiking out in the nearby Columbia River Gorge, there is a very interesting bridge I often cross in order to access trails on the Washington side of the river. This is called Bridge of the Gods, named after the American Indian legend that tells of a natural span across the river at this point in ancient times. It’s fascinating that geologists have, at this precise point along the river, determined that a landslide hundreds of years ago may have temporarily dammed the river. In fact, if you climb up and view the area from above, you can see the remnants of this old landslide as plain as day. The Bridge of the Gods crosses the Columbia River from Oregon to Washington. The California Coast is the attraction to driving Highway 1, the Pacific Coastal Highway. The Bixby Bridge is near Big Sur. Along with scenic bridges such as those along the Pacific coast (such as the Bixby Bridge in California above), my travels have taken me across some great examples of foot bridges. Take the suspension bridges along the trekking routes in the Himalayas, for example. They receive constant traffic, both human and yak, and are just as important as highway bridges where roads not trails connect communities. All of the supplies (not to mention the trekking tourists) that mountain villages rely upon must pass over them, so they are generally maintained. I love any foot bridge, especially of the suspension variety, since you can make them sway and bounce so easily. Strange that others on the bridge often get upset when I do this. One of the main footbridges spanning a deep gorge on the way to Namche Bazaar in the Everest region of Nepal. Mount Rainier’s Wonderland Trail crosses a high suspension bridge over Tacoma Creek. I like how on some bridges the builders took some time to decorate the abutments, or bridge ends (as in the image below). Also the bridge itself is often decorated. I have seen and crossed many bridges that unfortunately I haven’t photographed well. The bridges over the Seine in Paris, Florence, the ones in Venice of course. 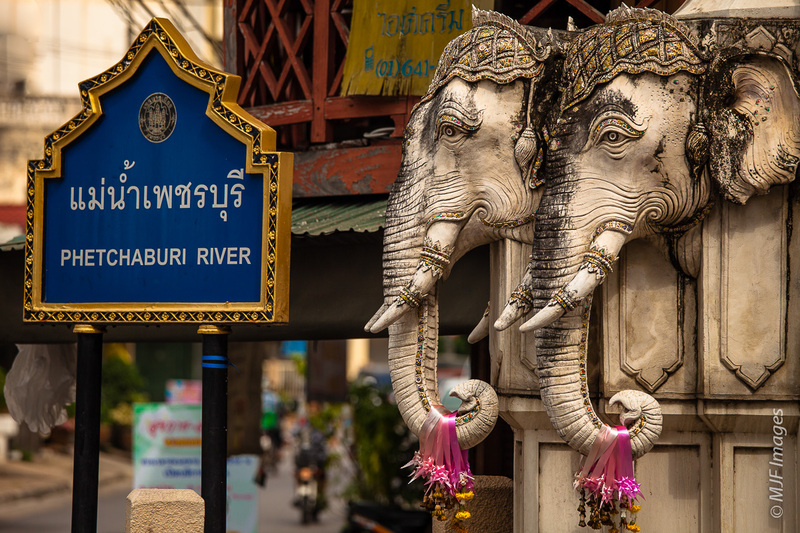 A bridge abutment in Thailand is carved into elephant heads. I live in an area with many old covered bridges relatively close-by. It is sad that I have not spent the time to photograph them well. This challenge has given me a kick in the pants, and when I can get down there (hopefully very soon) I will post an addendum to this. The red light of a stormy sunset illuminates the Willamette River as it flows under the Steele Bridge in Portland.